Agricola and the idea of playing Caverna have completely hooked me recently. These amazing games add so much depth, and are great games to learn. There is so much to learn, and so much fun to be had from playing these games! Check out why game developers of all types and genres should play these games. 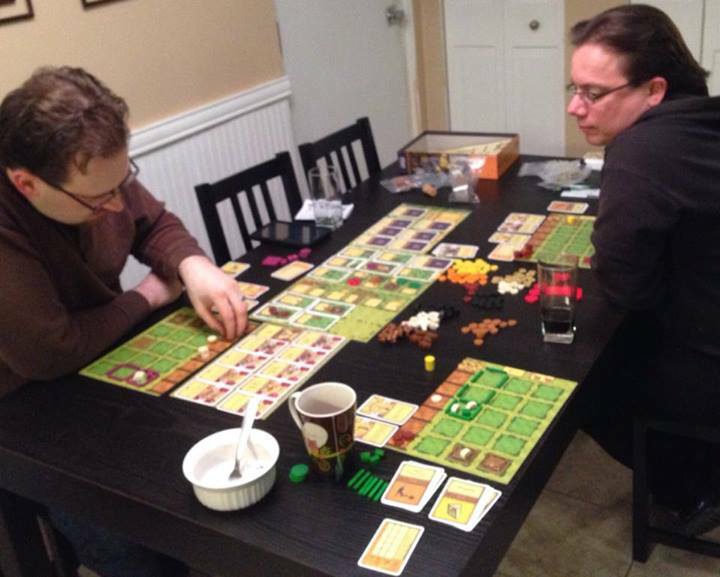 Myself (left) and PopeTom (right) playing Agricola. As you can see we just upgraded the dinning room to Clay. THE worker placement game by Uwe Rosenburg. This is a very popular game in the worker placement genre, and games like Lords of Waterdeep would not exist without it. There are plenty of design choices for game developers of all sorts to learn from in this game. If you haven’t given the game a shot yet, definitely do so. My wife played the game at TempleCon, and got hooked. Anyone interested in building a tense game without the crutch of violence, should play a few games of Agricola. The game does a great job of building tension, by providing tons to do, and many ways to do them, but limited time to do it all in. There are some odd choices as well. Players draw a hand of 14 cards. It makes me wonder though, what would ‘Worker Placement’ become if instead of a generic agent, each agent was unique? This would be a good area for a computer game based on work placement to explore. ‘Agents’ could become a bit more literal. In an Agricola style setting for example, the Professions cards could be integrated more directly into the workers themselves. Specializing a particular worker into a wood cutter for example, might increase the yield when collecting wood. A great game with tons of inspiration. There have yet to be any truly compelling tablet (a nature choice for board games) or PC games to take advantage of the good and the bad of Agricola. However check out the iStore for the Agricola App. Another fantastic game, although not worker placement. The mechanics are simple, the game is easier to learn, but the effects of some tiles can be a bit mind bending. Carcassonne with economics is as close an example I can give. I have not played Caverna, but I really, really want to. So much so that I’ve already designed a mod for the game. The game is expensive, hard to find, and absolutely sold out. You cannot get this game easily (but if you do, let me know and I’ll play it). Although that link will take you to the Amazon page for the game, it will be tough to buy. MSRP on the game is $80.00 (US). If you’re lucky you can buy it for $140. Take a look at Rahdo playing Caverna. (Beware shaky camera) There are some really important mechanical changes to the game play. Fences and clearing land were both streamlined. A lot of annoyance was removed with a couple simple changes. It would help to have played Agricola to understand the changes in Caverna. In a creative industry you have to take inspiration from all kinds of sources. It baffles me that more companies from the computer game development side of conventions (say, Pax East for example), don’t wander over to the board game side for inspiration. There could be a lot to gain for electronic game developers checking out board games. After all card and RPG games have definitely crossed into the digital domain. And if you’re going to buy the games, buy them through my links at Amazon. Help support the blog. And let me know if there’s a game you think developers should play.